I really dig mulching blades, and by the end of this discussion, I hope that you should be able to dig them too. Aside from its extremely tidy output and unbelievably symmetric offering on your lawn, the simple yet efficient function of the best mulching blades in your lawn mower is just as very tempting as it is rewarding. But just how would you know that what you have is the best one around? What are these crucial variables that you must equip yourself to arrive at purchasing the right one? Today, I’ll be answering these queries head on, with more substance on the latter. But before we delve into them deeply, I have identified the five best mulching blades in the competition now: the best of which will be revealed at the very end of this post. Without much dilly-dallying, here are the five most-sought mulching blades that are worth your look. Right off the bat, you won’t get dismayed with MTD’s 21-inch Mulching Blade. It fits almost all of the known mowers and won’t break your wallet with its affordable price. Durability is also expected in its robust and well-made construction. Meanwhile, the product’s installation won’t make you dizzy as it is both easy and uncomplicated. And as soon as make the first cut, you can tell the difference in the quality of its cut. Expect a “pain or glaze” right on the blade’s sharp part as this should prevent you from potential injury. But right after you run it, the cover will disappear, and the blade should perform as you would have expected. Ultimately, this easy-to-install alternative is a lot easier to use as opposed to spending an inordinate amount of time sharpening your old, duller blade. Oregon Chai’s Longer Life 596-900 Gator Fusion boasts of quality gator with the patented “Fusion G5” mulching blades. These fusion blades are armed with Tungsten Carbide that is “fused” right to the edge for prolonged life. Meanwhile, it also is equipped with extended cutting length and blade comes with one that is sharpened longer up in that area. On the other hand, its one-of-a-kind design has reinvented the way these blades mulch grass clippings with longer outputs at that— resulting in less bagging and raking and a decomposition that is much quicker. Apart from these, the use of these blades benefits your time by saving it and eliminating the need to bag. It also saves your money with you not paying for an extra when it comes to recycling. More importantly, the Gator MulcherTM blades are made to last longer especially in sandy oil conditions. 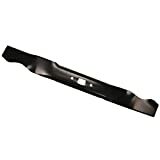 The Maxpower 331981S 21-Inch Universal Gold Mulching Lawn Mower Blade is especially ideal for a greater cutting surface that results in mulching being increased. It has a centrifugal air lift design that provides you that highly sought uniform chopping distribution. Its 1-inch center hole is designed with reducing washers that come in a myriad of sizes: 3/8-inch, 9/6-inch, ½-inch and a lot more! If you want cleaner, finer cut right out of your mower, the Commercial Gold Metal Mulching Blade that comes with sharpened cutting teeth should address this need. A known universal replacement for virtually all 21-inch cut mowers, our third entry is made straight from the US. If you’ve come here to get your money’s worth, the Rotary Set of 2 Mulching Blades is the one for you. Its affordable price is set comfortably for a set of two quality brand-focused blades, both of which undergo heat hardened steel process. Design in this product is also paramount as it is patented; the same can be said to its mulching results that are nothing but exceedingly superior. The blade which replaces many Toro Blade variants can also be used as a mulcher even if you don’t have a mulch plate. Now, if you use it with only a bagger, about one-third of the clippings should go in the bad; the rest of it is mulched back right in the grass. Start saving yourself some time and money by removing your current, dull bagging system. These blades are rugged! 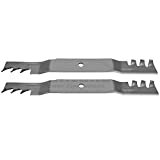 The Stens 340-066 PK2 Mulching Blade, Set of 2 is very much ideal for anybody who chooses to experience what Stens has been providing for years now – fit and durability. Its features and aesthetics should be able to address most of your requirements in a set of mulching blades. It is currently one of the most affordable products from this true and tested brand in this otherwise populated marketplace. Meanwhile, the product’s protective coating right on its blade should gradually come off and leave you a shiny metal that comes with a much sharper edge, rendering a uniform cutting on your grass. If you’re looking for something that provides sharpness, efficiency, and affordability, this one is waiting for you. Owning a perfect lawn takes a lot of patience and hard work. And in this respect: a lot of research as to what makes your mulching blades quality and high-functioning. Just the combination of these should ensure a functional mulching blade. Best of all, these blades don’t always belong to the higher end of these blades. You don’t need to spend that much just to get this feature. Often, it is so easy to fall for those well-crafted commercials that essentially how good those blades are. The point I’m trying to drive here is that you have to ensure that your lawn mower can fit the blades snugly and that it operates them without a glitch. The surest way to know this is to invite someone from your local store to go to your house to verify whether the blades will fit well. More importantly, that personnel should ascertain that the lawn mower itself is functioning with your chosen blades. At all cost, it is highly discouraged to mix the mulching blade along with a high-lift blade. This can potentially create disastrous repercussions and may injure you in the process. As it goes, various types of life are a perilous thing and that they shouldn’t be fused in any reason whatsoever. If your manufacturer neglects to provide the specification of the slot type in which mulching blades should fit, make certain that you do not make this purchase. This feature is make-or-break among all these details so please don’t fail to determine this unless you’d like to end up regretting your purchase. #5 Remember the spare parts! Yes, remember those spare parts. A company that supplies spare parts religiously is something that you should consider. Your mulching blades are bound to rust, age, and withstand many years of prolonged use, so a company that is more than willing to supply these parts are more than necessary. Getting the best mulching blades can sometimes be very tedious but this can be lessened once you’re knowledgeable on the other features these blades should possess. Apart from the considerations that were mentioned above, I have also collated some tips that you can use when selecting the ultimate mulching blades. Tip #1 Shape, shape, shape! The importance of your mulching blades’ shape couldn’t be more overstated. Even if you have all the bells and whistles in them, it all boils down to its fit to your lawn mower. If you’re a beginner, then things could get a little more overwhelming for you as you will be subjected to a large amount of information relative to the types of these blades. The best way to avoid this mishap is to equip yourself with the blades’ specifications along with the types of mower. Some regular mowing blades are made with less advanced materials and ultimately, quality. As it goes, mulching blades are more advanced and come with some of the most quality materials. Mulching blades are made to last, but if these are not made of quality materials, you won’t be able to use them that long. Your mulching blades’ size will determine what kind of cut it will do on your lawn. As such, your preference here is paramount. Would you go for a faster yet bigger type of cut? Do you plan to get a nice, smaller cut right on your lawn? Ask the seller from the store if which of these mulching blades will produce these kinds of cuts. The angle of curvature is also crucial when choosing the right mulching blade. It plays a part in the blades’ general effectiveness. Also, it depends on the grass’ type along with your lawn’s shape. The general rule states: the thicker the grass, the bigger the angle should be. Before you jump on all of these, it is a must that you know your financial boundaries. But whether your budget falls on either side of the spectrum, you can still get the best out of your money. The trick, really, is how strategic you are in choosing these blades. Also, ensure that you combine all the tips and the accompanying buying guide I’ve provided above! 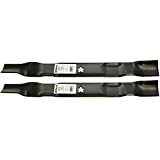 Stens 340-066 PK2 Mulching Blade only entry on our list impresses me the most. It’s my ultimate bang-for-the-buck product. While it also comes with some drawbacks, these are highly redeemable for its excellent fit and durability that are only rivaled by its affordability. If you want a product that does its function nice and even without nudging you with some second thoughts, this one is definitely worth your look. Do you think Stens ﻿340-066 PK2 Mulching Blade deserves its top spot? Do you have any more tips right off our quick buying guide? If you do, please feel free to sound them off in the comment section below.